When it comes to creating compelling content, marketing is leading the way for communication functions. Content marketing is realizing that “when you sell a product, you make a customer for a day, but when you help them, you make a customer for life” (Jay Baer). This is the concept behind Jay’s book Youtility, and I believe it can be easily translated to help revolutionize the way the Internal Communication function achieves their goals. Jay’s key message is that by providing help and value to customers (for free), companies will be able to cut through the incredible amount of content clutter that exists online and be top of mind when those customers are ready to buy a product or solution. Internal Communicators face a similar information challenge inside of an organization. The 2014-2018 Email Statistics Report by The Radicati Group reveals the average employee receives 121 emails each day, and this number will only grow. While email is arguably the most popular form of business communication, you know it is not the only form. Meetings. Newsletters. Town Halls. Voicemails. Podcasts. Leadership Blogs. Intranets. Yammer. YouTube Channels. And on and on. As professionals in the business world, we can personally relate to the pain that each employee is feeling as they attempt to get their work done amidst this deluge of content. Translated to Internal Communication, this means that communication professionals must make sure that the information that CAN be shared IS shared and promoted to those internal audiences that would benefit the most from it. A breakdown in information flow can get in the way of this, even in the most well-intentioned companies. For example, a communication cascade is a frequently-used internal communication channel; however, not every manager or leader is equal in their ability to effectively communicate. The result is often a distorted or partial message. There also may be functional or departmental silos preventing messages from moving horizontally across the company. Every communication touch point is an opportunity to develop a relationship by providing youtility to your employees. It’s not about creating more exciting communications, but creating communications that HELP . Marketing is focused on listening to understand two things: what prospective customers need to make better decisions, and how the company can improve the customer’s life by providing it. 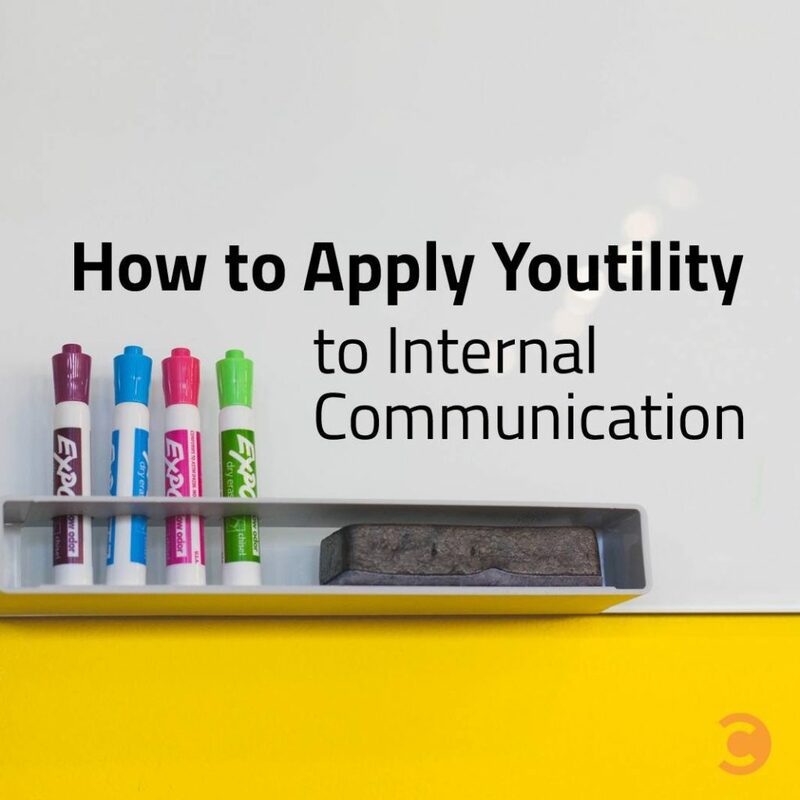 Youtility for Internal Communication, then, would mean focusing on listening to understand what employees need to be more engaged and how the company can improve the employee’s life by providing it. Employee engagement is one of the most common and important goals for a communication function. Recent statistics illustrate why: Although the percentage of U.S. workers engaged in their jobs is on the rise (average 31.7% in January to an average 32.9% in February), half (50.3%) are “not engaged” and 16.8% are “actively disengaged” (Gallup, 2015). A crucial concept in Youtility is listening. You can’t help employees feel more engaged if you don’t know what they want or need. To find out what matters most to your employees, you must listen to them first. Ask HR for insights. For example, they may be able to provide you with themes from exit interview data or other employee statistics. Facilitate focus groups or interviews with employees. Analyze entries to company help/suggestion boxes. Be on the look out for complaints and compliments posted publicly online by your employees or questions from prospective new hires. Jay knows that it is not enough to listen and understand your customers’ needs—you must dig deeper, so you also know how and where they prefer to access information. This concept can be illustrated for Internal Communication in a quick story. A few years ago, I was working with a consulting firm charged with doing a communication audit for a major electronics store. We wanted to find out how to improve employee communications. One department of the company offered installation services for stereos, televisions, etc. It was the company’s belief that the best channel to get information to the employees out on installation calls was email via a handheld device. My team members who spent a day riding along with a few of these employees discovered they spent most of their time driving to and from appointments or crawling around customer’s attics and floors. They did not have an opportunity to check their email until they were back home—and not on official company time. As a result, installation employees skimmed or ignored company communication, and did not always receive what they needed to stay engaged. Youtility is not always easily found, unless a smart marketer spends the time promoting it. Internal Communication can learn from this by placing “you-seful” content in multiple places, ensuring that the message fits the medium. Wade Harman highlighted the importance of not only creating and placing great content, but nurturing relationships that will help you share your information. Inside an organization, these individuals may be called key influencers and are not always the highest ranking folks. Find out what informal communication channels exist in your organization and who curates them—those are the employees you want to get to know. Creating Youtility is a big task, so Jay suggests sharing responsibility with everyone in the company, as each employee holds valuable information. It brings credibility and effectiveness to the process. This is no different for Internal Communication. Your job as a communication professional should be focused on finding that valuable information, packaging it based on your understanding of employee’s needs and preferences, and spreading it to appropriate internal audiences. You’ll be encouraging greater cross-functional understanding, collaboration, and overall engagement. Jay explains that Youtility never ends—it is something “you tackle forever.” I might even take that a step further by saying Youtility is a mindset—a way of thinking and being. Youtility can be a lens you use to look at every communication you create. What metrics or data are available? How can you gather that information? Helen Andersen is an independent leadership development and communications consultant with over 10 years of experience working with Fortune 500 companies around the world. From her one-on-one coaching practice to developing training for her clients’ employees, she is passionate about helping people love their work and their lives.